A new process called “value engineering” is being deployed by the Arizona Department of Transportation to help reduce project costs, shorten delivery times, or both. And a project that aims to replace the decking on Interstate 17 bridges at Willard Springs Road south of Flagstaff highlights the benefits of that philosophy. The Arizona DOT said that instead of replacing that decking over the course of two summers – with the project ending well into 2019 – the “value engineering” protocol is enabling the bridges to be completely replaced before the Thanksgiving holiday this year; all at no additional cost. 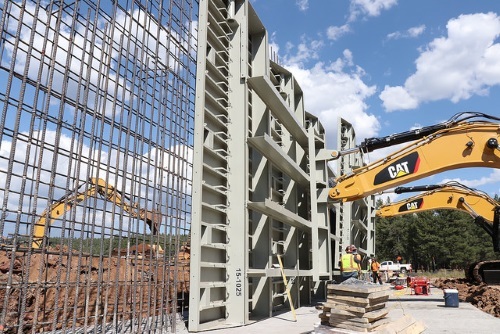 The agency said that, once a project has been awarded, it sits down with its contractors to “systematically analyze” the project’s plans and identify ways to deliver improvements safely, reliably and efficiently for the lowest overall cost possible. In this particular case, the Arizona DOT said in a statement that – as an alternative to removing and replacing just the bridge decks at I-17 and Willard Springs Road – its contractor, Fisher Industries, proposed creating new bridge abutments as well by using giant steel plates attached to construction vehicles as molds around rebar cages. Once the concrete sets, the steel plates can be moved quickly, allowing crews to pour concrete for another part of the abutment. Typically, building such “abutments” takes weeks, but the technique being deployed by Fisher – being used for the first time on an Arizona DOT project – took only days, Steve Monroe, senior resident engineer for the agency’s North Central District. In addition to improving delivery time and value, having both bridges done in one season rather than two reduces the length of time drivers must deal with restrictions at Willard Springs Road, Monroe noted. The Arizona DOT added in an email to the AASHTO Journal that contractor incentives help encourage the use of “value engineering.” For cost savings, the agency said there is a financial incentive as the contractor receives a percentage of the amount saved through value engineering. For time savings, unless there’s a dollar value assigned to that savings, both the contractor and Arizona DOT benefit from the reduced overhead to complete the work.